Dessert junkies, looking for something more than just your average brownie? 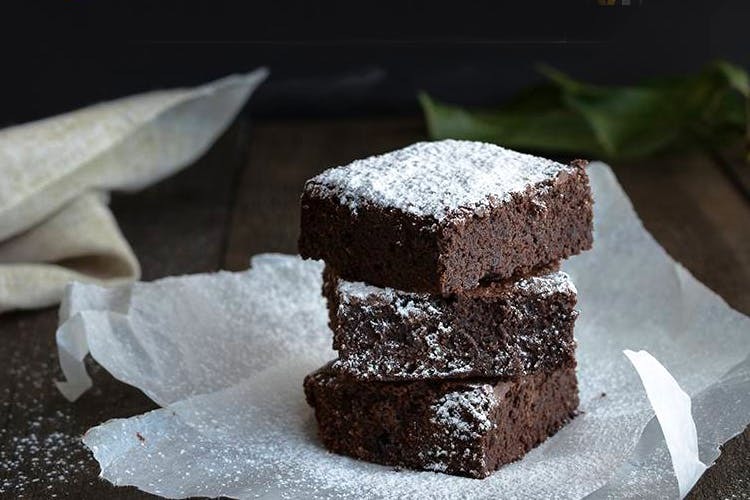 Just drop in at Brownie Heaven to try out interesting pairings that include brownie desserts, shakes, and even make your own kinds with everything from toffee sauce to even crushed potato chips. Located diagonally opposite The New College, Brownie Heaven (they have several other branches in the city) has a small outlet in Royapettah. It maybe small in size, but big on variety! Even the shakes on the menu come with brownies. Check out the Peanut Butter Brownie Shake or how about the (well, kind of) Madrasi Filter Coffee Brownie Shake? The brownies here come in all kinds of flavours (24 when we counted) — the Classic of course, but also Chilli Chocolate, Salted Caramel Fudge and Red Velvet to name a few. They also do elaborate dessert versions like Banoffee (with sliced bananas and toffee sauce), Tiramisu (with crunchy cookie bits and coffee mascarpone cream) and Brownie Blackforest (with cherry filling, whipped fresh cream, and chocolate shavings). Yum! But if you want to choose something offbeat, why not make your own brownie? Add chocolate chips, ice-cream, gems or even (gasp) potato chips? Interesting isn't it? You can order a range of their brownies online even if you’re in Kolkata, Delhi and Bangalore. Hurray! !